To Mary Wollenstonecraft-Shelley, author, dramatist, essayist, travel writer. From Felicity Tolley. Thank you for being brave and creative. 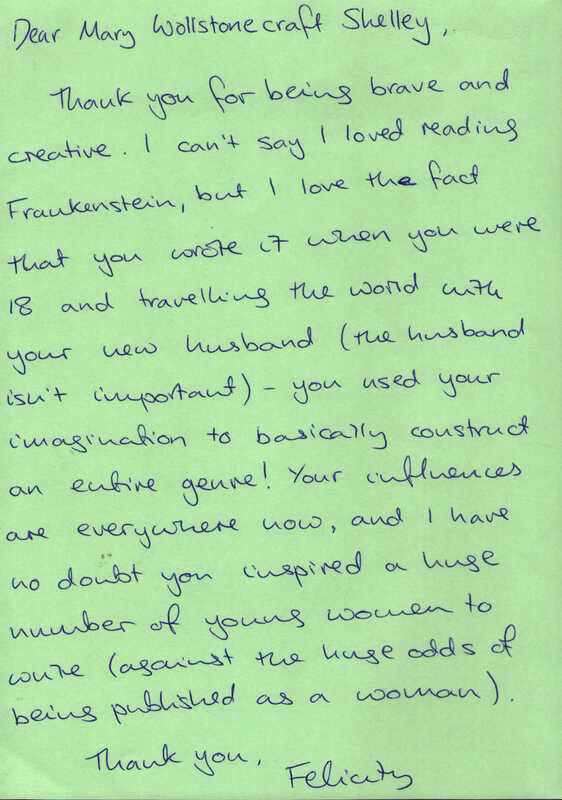 I can’t say that I loved reading Frankenstein, but I love the fact that you wrote it when you were 18 and travelling the world with your new husband (the husband is not important) - you used your imagination to basically construct and entire genre! Your influences are everywhere now, and I have no doubt you inspired a huge number of young women to write (against the odds of being published as a woman). author, dramatist, essayist, travel writer. Born 1797, died 1851. More information about Mary Wollenstonecraft-Shelley.